This Nit Alisa movie page contains 2 records. Lao Thong (Sorapong Chatree) is a Hmong leaving in Northern part of Thailand. He has a wife called Siew Fa and a young boy named Soo Noi. While he is away, his wife Siew Fa has been kidnapped by ruffians, who have been threatening the mountain villagers since years. Lao Thong's nickname is the Mountain Lion (เสือภูเขา) as he can run very fast. Lao Thong goes after the ruffians and find their camp. Their leader is Museudam. Lao Thong and Siew Fa have to kill Chayo, Museudam's brother, in order to escape from the ruffians' camp. They need to flee with their son from the Hmong village as Museudam seeks for revenge. Unfortunately Lao Thong and his family are captured by another ruffians group. Hopefully their leader, Cha Teun, is a former sergeant who knows well Lao Thong. Some ruffians believe they are undercover policemen so Lao Thong has to fight and defeat them to win his freedom. Opium trade has always been a huge traffic in Northern Thailand due to Golden Triangle (Burma, Laos and Thailand). Lao Pho (Lak Apichat) is a Hmong village working with the police border to neutralize local ruffian gangs. Cha Teun's gang is attacked by the Police. Cha Teun believes that Lao Thong is the traitor who warned the police. Then both gangs decide to take revenge over him. They decide to hire another Hmong as only a lion can catch a lion. His wife, Siew Fa, is injured. Na Cha (Jarunee Sooksawad), Lao Pho's sister, helps them. Museudam and Cha Teun try to hire Lao Pho (แมวไม่ฆ่าแมว) but to no avail. So Museudam kills Lao Pho's father and accuses Lao Thong so he suceeds to convince Lao Pho's to chase Lao Thong. Na Cha fights very well but is in fact a girl. Siew Fa finally kills herself to avoid being the one slowing her family down. Lao Thong takes revenge over the ruffians, who disband. The two ruffian groups even kill each other and only Cha Teun succeeds to flee as his own gang is wiped away. A love story starts between Lao Thong and Na Cha. Na Cha succeeds to convince her brother that the culprit is Museudam and not Lao Thong. Museudam kidnaps Lao Thong's son. Lao Thong, Cha Teun, Na Cha and Lao Pho storm the ruffians' campement. Ruffians are defeated but Lao Pho dies while protecting Lao Thong. The Mountain Lion is one of the most famous movies directed by Kom Akadej. It is shot within beautiful Thai northern landscapes. 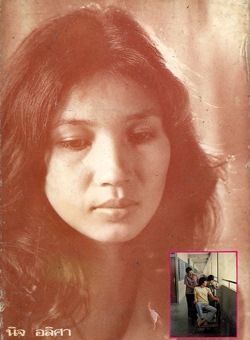 It was one of the few Thai movies dealing about Hmong community. 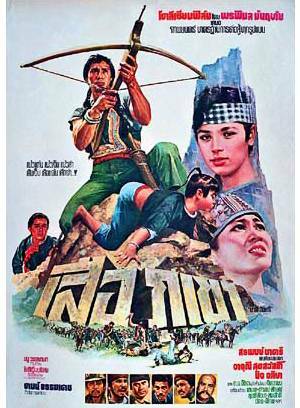 The Mountain Lion - เสือภูเขา (1979) movie remains famous for its Kung Fu scenes. This film was one of the first to mix elaborate stunt work and well choreographed fight scenes. 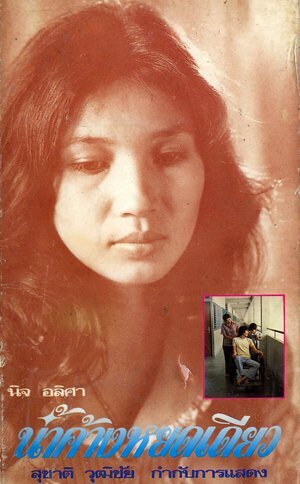 Movie น้ำค้างหยดเดียว (1978) starts with a depiction of Bangkok daily life with street children selling newspapers to drivers, traffic jams, bus over packed, people rushing to office. Prang, 24 years old young lady, has the bad news she has been dismissed. Ton, her 7 years young boy, is not going to school and is selling newspapers (Daily news, Thai Rath). His father Plot is handicapped and cannot walk anymore. He decides to cut his veins (อยู่ไปก็ไม่มีประโยชน์). Ton arrives on time. Private hospital refuses to take him as he has no money. Hopefully it is still on time in overcrowded public hospital. Prang wishes her son to stop selling newspapers as she is worried he could be hurt by a car. She finds a job selling insurance (ประกัน) but needs to give her body away too to finalize contracts. She has difficulties to find a job as she didn't study high. The doctor also tries to have favours from Prang. As Prang needs to pay doctor bills, she has no choice but going to pawn shop (โรงรับจำนำ) managed by a Chinese owner. Unfortunately a robber steals the gold necklace Prang wanted to pawn. The police is too slow and useless to help. The factory owner refuses to take any responsibility in the accident that caused the father to become handicapped. Having no job, having no money, she finally accepts the doctors advances. What is the meaning of life (ชีวิตคืออะไร)? Fight (การต่อสู้)? Pay for karma (กรรม)? She has to trade her body against free medicine and feels guilty. The doctor recommends her for a work in a private VIP club. One of the club customers, Khun Kleup, proposes her to become a singer and renamed her as Nam Kang Diaw (น้ำค้างหยดเดียว). Prang surprises her son still selling newspapers. Her wrath disappears when she understands that Ton wants to buy a wheelchair for his father. The father tries hard to walk again. Khun Kleup brings back a bird to Prang and visits her home meeting her husband and son. Jealousy and doubt happen on the husband side. Doubt also happens on Prang's side. Will her husband ever recover? Prang rejects Kleup’s advances. This causes Kleup's ire. As he is driving too fast, he collides with a motorbike. Kleup and Prang need to spend part of the night at police station. As Prang gets home very late, both Ton and the husband Plot believe she spent the night with Kleup. The movie ends tragically. Plot jumps to death from the building. Ton gets suicide believing his mother is responsible of his father's death. Prang's life is wracked. This is a powerful social drama from decade 1970s showing how poverty can destroy people life. In opposition to many social dramas, the man, Plot, is here the weak character and the woman, Prang, is the strong character.